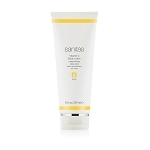 sanitas Redensifying Lip Complex is suitable for all skin types. Apply a small amount to lips as a finishing step to treatment. Oleic/Linoleic/Linolenic Polyglycerides, Simmondsia Chinensis (Jojoba) Seed Oil, Mangifera Indica (Mango) Seed Butter, Lauryl Olivate, Lauryl Laurate, Hydrogenated Vegetable Oil, Ethylhexyl Palmitate, Dipalmitoyl Hydroxyproline, Cetearyl Ethylhexanoate, Sodium Hyaluronate, Palmitoyl Tripeptide-38, Octyldodecanol, Trihydroxystearin, Glucomannan, Dictyopteris Polypodioides Extract, Sorbitan Isostearate, Portulaca Pilosa Extract, Sucrose Cocoate, Beeswax, Copernicia Cerifera (Carnauba) Wax, Caprylic/Capric Triglyceride, Flavor.